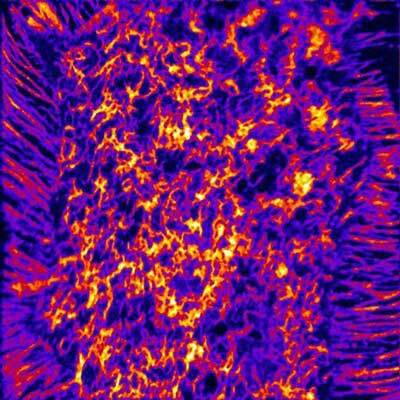 (Nanowerk News) Researchers from UCLA and the University of Western Australia have developed a new way of visualizing the distribution of cholesterol in cells and tissues. Their research provides insights into the movement of cholesterol into and out of cells and could eventually identify mechanisms linking cholesterol to coronary artery disease. Using a new high-resolution imaging mass spectrometry approach called NanoSIMS imaging, the team was able to visualize and quantify a pool of cholesterol called "accessible cholesterol" on the surface of cells. The accessible pool of cholesterol on the plasma membrane is thought to play a role in regulating production of cholesterol by cells and likely plays a role in the ability of cells to unload surplus cholesterol. "Accessible cholesterol" on the surface of cells can be detected with a cholesterol-binding protein from bacteria. By taking advantage of the bacterial protein, along with NanoSIMS imaging, researchers showed that the accessible pool of cholesterol is not evenly distributed on a cell's plasma membrane but instead is highly enriched on specialized projections from the plasma membrane called microvilli. "In the past, other scientists had speculated that microvilli play a role in moving cholesterol into and out of cells," said the study's co-author, Dr. Stephen Young, a distinguished professor of medicine and human genetics at the David Geffen School of Medicine at UCLA. "The discovery that 'accessible cholesterol' is highly enriched in microvilli lends support to that idea." The findings were recently published in the journal Proceedings of the National Academy of Sciences ("High-resolution imaging and quantification of plasma membrane cholesterol by NanoSIMS"). "We would like to gain a better understanding of the mechanisms of cholesterol movement in cells and tissues," said Jiang, a lecturer from the University of Western Australia's Centre for Microscopy, Characterisation and Analysis. "We believe that NanoSIMS imaging could yield new strategies for lowering cholesterol levels in the blood or at least new strategies for optimizing the effects of existing cholesterol-lowering drugs." Added Young: "The plan now is to use NanoSIMS, along with novel biochemical approaches, to investigate cholesterol distribution and movement in multiple cell types."